NASA's Messenger space capsule is aiming to photograph Mercury as it swings by, a prelude to putting the first spacecraft in orbit with the planet in 2011. The Messenger will fly 124 miles above the planet's surface to grab snapshots of an un-photographed part of Mercury the size of South America. The astrological community has long had problems with Mercury constantly going in retrograde, blaming it for taking down the Large Hadron Collider among other things, so hopefully the NASA capsule gets to the bottom of this mystery. We detail Mercury's various issues with our superior planet, and what NASA hopes to accomplish by photographing it, after the jump.Mercury orbits the Sun once every 88 days, and it obviously believes we're jealous that it's so close to the Sun. Wrong again, Mercury! We're tired of this constant fighting about who has more active volcanos, okay? Just stay quiet as we attempt to photograph your southern half. NASA's Mariner 10 probe passed Mercury three times in 1974 and 1975, but this is the first extended look we've gotten at the first planet from the sun since. 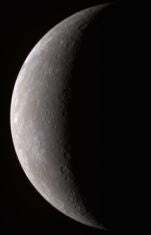 The Messenger's mission may be complicated by the irrefutable fact, suggested by astrologer Susan Miller, that Mercury in retrograde affects electronic devices on Earth, and took down the Hubble. This is an old theme that's been bouncing around in astrological circles for some time. Messenger will be photographing places previously unseen, including parts of its Southern hemisphere referred to as Mercury's "junk." Mercury has been shrinking, and more images may give us a better idea of why that's happening. (Our guess is that it's dieting because of shiny new planets intruding on its turf.) A spacecraft won't get in orbit with the planet until 2011, and the resulting post-orbit period will no doubt be full of awkward recriminations and a Messenger-Mercury sextape. Here's some scandalous imagery to tide you over until then.